Learning to hand pollinate is a no-brainer for the indoor gardener, but its a trick even those with a backyard garden or growing tomatoes in containers on the balcony, deck or patio should know how to do. You might wonder why you would need to pollinate tomatoes grown outdoors. They are self-fertile, meaning that both male and female parts are contained in one flower, and so they produce fruit without a pollinator plant. However, the weather isn’t especially cooperative every summer. Its a pretty common issue, lower garden yields due to poor pollination. Higher than average temperatures, and humidity or too much rain can put a severe damper on the size of your harvest. Normally the bees assist your tomatoes with pollination. Assuming you have bees in your area. There are problems with a lack of bees in some locations, and what if you wind up with no bees at all? It makes a good deal of sense to lend nature a hand here. Then there is the question of efficiency. Not everyone has room to grow dozens of tomatoes. Years that the weather makes creates slim picking – which is fine if you have dozens of tomatoes planted in the ground – but not if you only have a couple plants. Hand pollination can also give you a bigger tomato harvest off a smaller number of plants. It ensures that every blossom will bear fruit. Or the majority of them, depending on how thoroughly you attend to the task. With heirloom tomatoes that are not open pollinated, this allows you to save seed and grow true to type tomatoes again. There are seed houses in the U.S., like Tomato Fest, that avoid Monsanto like the plague, have signed the safe seed pledge and offer organic seed that will need hand pollination to grow the same tomatoes from collected seeds. You will see tipsters recommending to shake your plants. This isn’t the wisest idea. You can damage the stems and branches, or worse, break them right off. Not the way to enjoy a bumper crop. The best and safest two methods to use are described and shown nicely in the video below. You can use these for your indoor garden grown tomatoes as well as those grown outdoors. If so, it’s likely half of what the guy in the video said went right over your head. 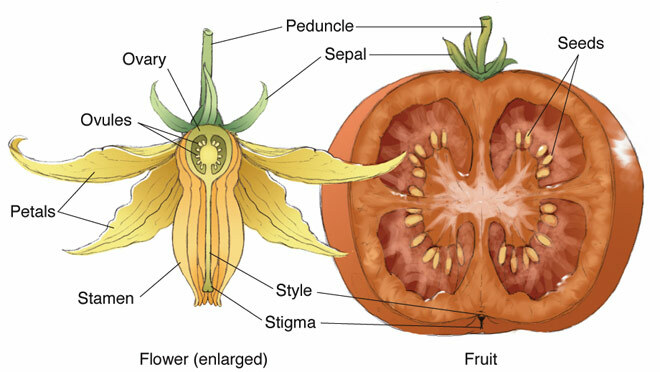 The image below will help you understand what he was talking about, and how it relates to the reproductive system of a tomato plant giving you fruit and seeds. Cross section image courtesy of Biographix Media.